Oprah Winfrey, Gayle King, and Sanjay Gupta launch the “Just Say Hello” Campaign to combat loneliness based on scientific evidence. If we compressed the 4.5 billion year history of the Earth into a 24 hour period, the first single-cell organisms would have emerged around 18 hours ago, the first simple nervous systems separating animals from plants would have emerged around 3.75 hours ago, the first brain would have emerged about 2.67 hours ago, the first hominid brain would have emerged less than 2.5 minutes ago, and the current version of the human brain would have emerged less than 3 seconds ago. The human brain is the most complex living structure known, and the determination of how the human brain works to maintain a healthy body and produce our mental and behavioral existence is one of the grand challenges in science. The mission of the Center is to create a rich intellectual environment and a supportive academic environment, to address this grand challenge, with an emphasis on rethinking what is possible. We do this through international, interdisciplinary, multi-level analyses, ranging from genes to societies, that utilize multiple methods in human studies and animal models. The common core for CCSN is rigor, quantification, and theoretical sophistication shaped by reproducible empiricism designed to disconfirm, or at least to identify the limits of, rather than to confirm apriori expectations. 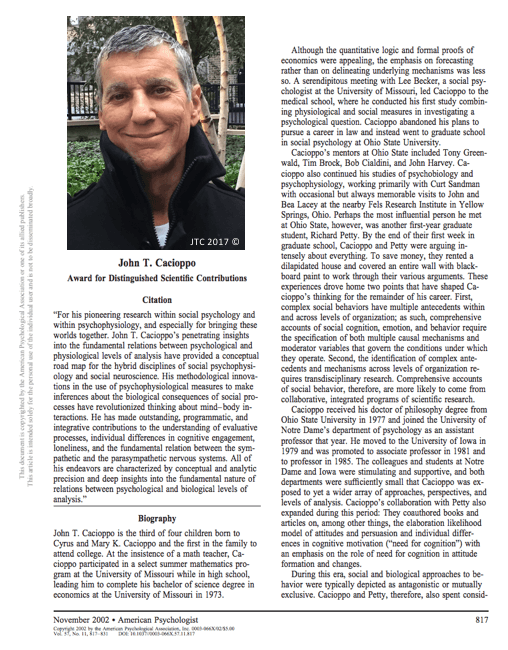 The CCSN recognizes that many of the big problems facing society today involve social and behavioral processes that are influenced by factors across levels of organization and scientific specializations. During most of the 20th century, Occam’s razor (“keep it simple”) shaped scientific inquiry on human behavior, with the effect being that scientists sought the simplest possible theories until the need for complexity proved overwhelming. The effect was that scientists were trained to search for a variable that influenced a human behavior, and when such a causal connection was identified to then seek to demonstrate its generality. The CCSN recognizes that it may be more productive to consider a prescription attributed to Einstein which states that “Everything should be made as simple as possible, but no simpler.” Consequently, the breadth of disciplines in CCSN permits a wide array of scientific perspectives (and sources of variance) – from the neurosciences to the social sciences – to be included. The launch of the Center was marked by a conference in 2004 entitled Social Neuroscience: People Thinking About Thinking People, the product of which appeared as a book by the same title (Cacioppo, Visser, & Pickett, 2006, MIT Press). “Thank you for the nice introduction, thank you President Zimmer, and thank you all for being here this evening. It means a lot to me that you are here to celebrate this occasion with us. I am also grateful to those of you who spoke this evening for your incredibly touching remarks. 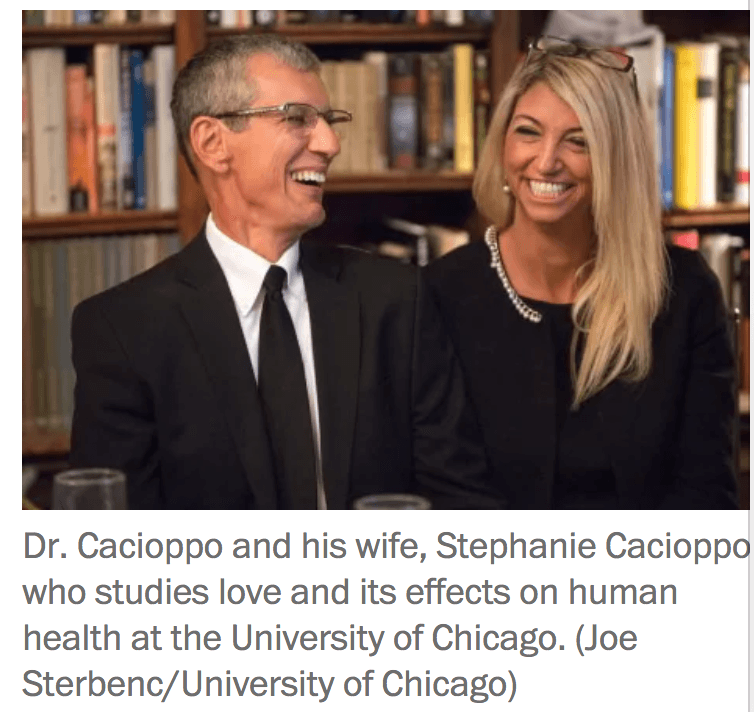 Thank you, too, to my wife, Prof. Stephanie Cacioppo, for her love and support. Stephanie is an invaluable scientific collaborator and the love of my life, and I am deeply grateful to her for her steadfast support through trying times no one could possibly have anticipated. My standing here this evening is a humbling experience, and I am personally indebted to each of you for my being here. Whether you know it or not, each of you in your own unique way has contributed to what we have been able to achieve. I therefore regard this evening as an opportunity for me to express my heartfelt gratitude to you. I know, too, that a number of you traveled considerable distances to be with us tonight. I am deeply touched and honored that you did so. Like you, my journey here began with a love for science. I love its humble nature and its grand aspiration. I love the wonder that science evokes, and the inspiration it breeds. I love the discipline that science demands, and its disdain for ignorance. I love its dynamic nature. Although respectful of the past, science embraces advances, innovations, and change. I love that science, by design, gives forward to future generations. And although we may celebrate individual achievements in science, I love the fact that meaningful scientific achievements are built on the contributions of the many. I have always regarded science as a passion rather than a career, and this perspective freed me to pursue the scientific questions that were the most compelling rather than the most instrumental. I found the social and behavioral sciences to be home to some of the most compelling scientific questions concerning human existence and the potential for its improvement. I also found that comprehensive answers to many of these questions required that we go beyond traditional disciplinary and divisional boundaries. As a simple example, the human genotype represents the molecular machinery through which human phenotypes and behavior are expressed. within generations over a lifespan through epigenetic processes to shape the expressed genotype. Neither the genotype nor the phenotype is directly reducible to the other because their roles are complementary, not redundant. 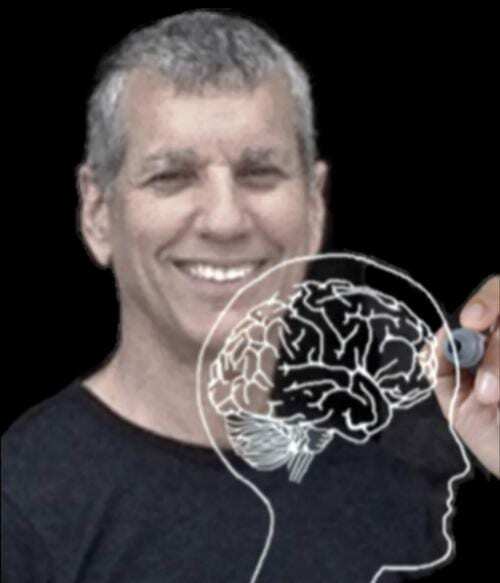 Comprehensive scientific accounts for the human brain and behavior, therefore, will ultimately depend on our understanding of biological, cognitive, and social influences. I also owe much to the University of Chicago. remarkable alumni who appreciate and support serious intellectual debate, rigorous scientific investigation, and ground-breaking scholarship. This is an institution toward which Stephanie and I feel tremendous admiration and affection. Indeed, I owe my very life today to the brilliance, expertise, skill, and compassion of the administration, faculty, and staff of the University of Chicago Medicine. These doctors are with us this evening, and we will forever be grateful for their giving us a personal appreciation for the story of the phoenix. Finally, the Social Sciences Division has long been one of the crown jewels of the University of Chicago, and I am in awe of the previous recipients of the Phoenix Prize – Coleman, Sahlins, Becker, and Lucas. It is a great honor to be considered among their ranks. More importantly, to celebrate this occasion with you this evening – and to have this opportunity to express my gratitude to you – is the substance of which dreams are made.